When you cook the daal in the pressure cooker, add the tomato pieces, green chilli pieces, hing, turmeric powder and salt. Cook the daal as usual. Heat ghee in a pan and make tadka with red chillies, curry leaves and panch puran. 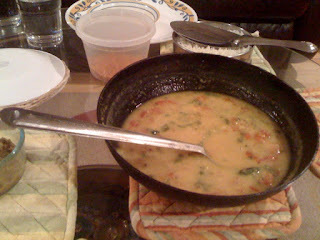 Add cooked daal to the tadka. mix well. Add water as needed. Bring to boil. Add lemon juice for extra khatta taste, salt as needed and mix well. That's it - garnish with fresh coriander leaves and enjoy with white rice and achaar. I have never tasted such a dish and that is so great to taste new meals.